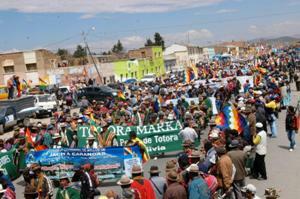 Who Is Evo Morales & What Is The MAS ? Morales' organisational skills set him aside: by 1985 he had become the general secretary of the union, and three years later the general secretary of the Federación del Trópico, one of six federations of coca growers into which the Chapare was divided. In 1996 he became leader of the six federations. A year later, in the general elections that brought Banzer to power, Morales won a seat in Congress to represent the Chapare, gaining 70% of the vote. As Banzer's so-called Plan Dignidad, Dignity Plan, took effect, Morales became a key figure in denouncing the increasing militarisation of the Chapare caused by Banzer's plans to eradicate coca . Morales even invoked the need for armed resistance. He therefore became a target for the supporters of Banzer's so-called 'megacoalición', a coalition of various right-of-centre parties led by Acción Democratica Nacionalista (ADN)'. In 2001 Morales was accused by his fellow congressmen of being the 'intellectual author' of the death of four policemen at Sacaba, the coca market just north of Cochabamba that the Quiroga government (which took over on an interim basis in 2001 due to Banzer's later fatal illness) had sought to close down by force. His expulsion from Congress simply served to increase his popularity, and in the 2002 presidential elections he only narrowly missed being elected president. As a union leader in the Chapare, Morales imbibed the long tradition of Bolivian trade unionism (sindicalismo) , strengthened in the Chapare by the inward migration of former mineworkers following the closure of most of Bolivia's state-owned tin and silver mines in the years after 1985. But peasant unionism at that time was also suffused with the notion of indigenous emancipation (indigenismo) , inherited from the Katarista movement* and which had become a powerful influence in the peasant confederation, the Confederación Sindical Unica de Trabajadores Campesinos de Bolivia (CSUTCB). In the 1993 elections, the cocaleros, along with other peasant groups, sought to set up a new political movement, called the Eje de Convergencia Patriótica (ECP). The results were disappointing. Two years later, new attempts to create a 'political instrument' for the peasant movement were more successful. The Assembly for the Sovereignty of the Peoples, Asamblea de la Soberanía de los Pueblos (ASP), came into being. This was a largely peasant organisation with a more marked pro-indigenous discourse. Denied legal status in the 1995 municipal elections, it 'borrowed' the name of a registered (but redundant) political party, the Izquierda Unida. Under this name the ASP won control of ten municipalities, mainly in Cochabamba. In the 1997 elections, the IU won four seats in Congress including Morales. Following a split between Morales and fellow ASP leader Alejo Veliz the year after, the latter held on to the ASP title, whereas Morales created the unwieldy sounding Instrumento Político por la Soberanía de los Pueblos, IPSP. For the 1999 municipal elections, Morales again acquired another defunct party title, the Movimiento al Socialismo-Unzaguista (formerly a splinter of the right-wing Falange Socialista Boliviana , FSB). Thus it was that the MAS-IPSP [the full name of the current governing party] was born. The MAS effectively represented a new sort of political movement: one that borrowed from the sindicalista as well as indigenista traditions; one that made much of the defence of coca in a strategy of national sovereignty against the interventionism of the United States; and one that highlighted the need for communitarianism. *'Katarismo' was a movement which grew out of peasant and indigenous organising during the 1970s against price increases imposed during the dictatorship of General Hugo Banzer. Taking its name from Tupac Katari, leader of an indigenous rebellion against the colonising Spanish powers in the 1780s, the movement was key in founding the first ever peasant farmers' union to become a member of the powerful central trades union confederation, the COB. Katarismo was significant in fomenting common cause between urban or mineworkers movements and peasant groups. It remained an active political force until the late 1980s.